This paper was written for a graduate level M. Div. class at Fuller Theological Seminary. The author of the book I used, James W. Sire, has authored an impressive suite of books that you should check out. Surprisingly to me, the spiritual discipline of â€˜praying the psalms,’ as author James W. Sire constructs it, is much more than a mere subjective, meditative romp across the emotional peaks and valleys of Hebrew poetry. In fact, the term â€˜prayer’ is a bit of a misnomer, since Sire includes a few stages in his method that include intellectual and historical investigation of the psalms’ authors and circumstances. 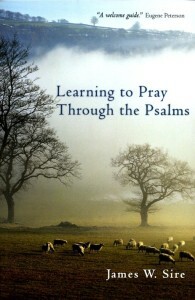 Sire’s six-stage approach to experiencing and understanding the Psalms, as outlined in his book Learning to Pray Through the Psalms, is a pleasantly integrated, balanced and full-orbed mix of subjective and objective investigation, of emotional, intuitional, and intellectual approaches. His six stage structure also forms a convenient structure for documenting my own experiences with his method in this paper. Interestingly, although this description might seem overly unstructured and subjective, I experienced two unique approaches hidden within this stage. The Lord – not just anyone, but the actual Lord of the Universe. Wow. The Lord is my – a term of ownership, like ‘I am my beloved’s and He is mine’ – God allows me to claim his friendship. I can experience the mutual ownership of friendship and love. The Lord is my shepherd – my personal manager, gentle protector, guide, caretaker, with concern for my wellbeing. Not just anyone, but the actual Lord of the Universe is right now, in this current moment, my personal friend and lover, whom I own, and He owns me. Even more, this all powerful God is my personal caretaker and guide, with real concern for my soul and wellbeing. However, one of the limits of this approach is that often, the link between phrases or paragraphs is not always obvious, so that this reconstructive approach breaks down between focused passages. This problem gives rise to the next two stages of structural analysis. Poetry and song are as much a structured art as they are a mere emotional outpouring – the great poetic forms, like iambic pentameter, chiasmic rhyme, parallelism, or repetition, can carry the content of a poem to emotional and polemic crescendos, or to a pugilistic focus that destroys our misconceptions or affirms our experience and convictions. Having completed a subjective, emotional experience in stage one, in this stage, Sire moves us to rationally consider the poem in order to begin to plumb the depths of the author’s motives and foci. One of the great benefits of this analysis is in finding the connections between ideas and thoughts so that the â€˜jumps’ between sections begin to make sense – the flow becomes more obvious, and we follow the psalmists logic. This connecting of the dots had an unanticipated effect on me, that of a shift in perspective away from myself. Admittedly, I read the scriptures, especially the Psalms, primarily from a self-referential perspective. I am looking for â€˜what speaks to me.’ This valid rubric is a common principle of many accepted meditative disciplines, such as the Lambeth Prayer or the SOAP method. But when I began to ask myself, for instance, â€œWhy does Psalm 23 jump from the care of the soul to the valley of the shadow of depth?â€ I realized that I had misapprehended the emotional intensity of the security sought in the Shepherd’s care. When seen connected to and in light of mortal danger, I realized that the psalmist was experiencing something much more intense than the mild comfort I was associating with the passage. At this point, I grasped that connecting the rational flow was important in order to understand not merely the methods of the psalmist, but the perspective necessary to make the psalm a comprehensible whole. And in doing so, I had to get out of my self-referential position, and essentially understand another person’s experience, not just my own. This shift to the author’s perspective often opens up the psalm at an entirely new and novel level, and can develop our ability to empathize with others. In modern parlance, there is a difference between Christian music that is unidirectional ministry (from God to me to you) and bidirectional worship (between me and God). One of the prominent patterns of the Psalms is the dialogical back and forth of the author. Other times, it seems the psalmist is waiting for or hearing an answer from God – such as in Psalm 130, where the Psalmist speaks, then realizes he must then wait for God. The experience of imprecatory prayer is both uncomfortable and powerful. In my experience praying Psalm 137, I was heartened to realize that whatever negative emotions I might have, I can and should release them to God, rather than directing my anger at myself or others. I envisioned God as a giant and pure white ink blotter of cotton, and no matter how much blackness I let out of my soul, God could absorb it and remain white – it just disappeared into His greatness and love. I also was brought back to my younger days when God was healing me of the bitterness of my youth, in part, through grunge music. What was so powerful about grunge for my generation (and many since) was that it gave expression to the rage and hopeless we feel due to childhood hurts, without really aiming anger at any person in general. This lack of a direct target was, I surmise, due in part to the psychological fact that we are programmed by our dependence on our parents to NOT blame them, and we often feel guilty about directing our deep anger towards them. But the power of the music was not in finding a target per se, but in (a) finding harmless expression of our anger, and (b) acknowledging that it is present and even valid. Linguistic, cultural, and historic context are, of course, part of any sound hermenutic. When applied to the psalms, it gives even more life to the words expressed – we picture the protagonist in a real, dire situation, and understand their emotions even better when those details fill in the gaps in our imagination. Often, I find that I flag in my efforts at this stage of studying a psalm. Having gotten a good bit out of it, this stage seems like pure intellectual slogging. However, this and the next stage not only deepen our understanding of the emotional and historical context, they prepare us to encapsulate the lessons gained within a story that can be metaphorized and applied to similar situations in our own lives. For example, when we learn that the background for the repentant Psalm 51 is David’s moral failures with regard to Bathsheba, the repeated pleas for forgiveness and cleansing make a lot of sense, and his continued hope of obtaining mercy can be of help to us if and when we suffer severe moral failure. As we identify the motives, history, and the central assertion of a psalm’s central character, we can more clearly see the direct relatedness to our own lives. This step is perhaps the most satisfying of all because it captures and brings to a peaceful conclusion what can be a turbulent emotional ride. Exploring the psalms for me has been an entry into greater emotional experience (and I admit I like to avoid emotional extremes, preferring an even keel). My experience is that, now gaining a distance from the emotions of the psalm, having come to rest in God’s presence in a posture of waiting, believing trust, I can now distance myself from my own difficulty and difficult emotions by abstracting the sometimes personal lessons learned into a clean packet that can be used like a healing balm when needed. Perhaps this is not what Sire intends, but this six stage exploration of a psalm, engaging both mind and heart, can be deeply engaging, transforming, and daunting. Distilling what we have learned down to applicable principles feels safe and controllable. That is, until we actually use them as intended, at which time we enter into, not only the emotional and spritual process of transformation as our hearts come to meet scripture, but as our hearts come to meet the living God in relationship. I have fully enjoyed learning to pray the Psalms, and intend to employ it in rotation with my other practices, which include the prayer of examen, mindfulness, silence, and perhaps even lectio divina. The access to the emotional flow of a psalm has made them much more powerful to me, as has the context of the central characters.